What I wondered […] was why mammals were created in such a way that they cannot survive without their mothers’ milk. A newborn bird, for example, can survive without his mother if his father brings him tasty worms to eat. But mammal children must drink milk. That’s what defines a mammal. No other substance than milk can nourish them. This is one reason, perhaps, why we’re always forced to remember our milky pasts and can never be as free as the birds. 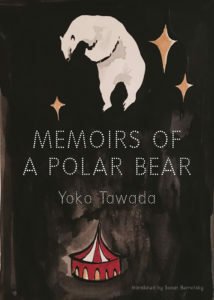 The novel’s premise — three generations of famous polar bears who come into intimate contact with humans — is inherently playful, and Tawada nurtures this quality by putting the reality of the events of the first chapter into question in the second by describing the first chapter’s as legendary. The grandmother passes down the desire to write to her daughter, Tosca — the second chapter’s star — who tells her trainer, Barbara, that her “mother believed that we have to find our way to the time before childhood.” When Barbara says that she’d like to read Tosca’s mother’s autobiography, Tosca responds, “Unfortunately it’s out of print.” Elsewhere, Barbara notes that because the autobiography is out of print and “no one had ever read it,” it’s “really more of a legend.” And by extending the novel’s fabulism beyond its facts — for instance, that a polar bear can speak and write — to the narrative structure itself, Tawada evokes the boundlessness and richness of possibility associated less with magical realism than with children’s fairy tales. After all, childhood is, for most of us, full of stories about animals, perhaps because it’s in childhood that our thinking about them is most open and indefinite. It’s easier to enter eagerly and without irony into stories of non-human animals who speak, stand, laugh, and love before one absorbs cultural assumptions about other animals and our difference from them. Tawada opens a space of human-polar bear empathy and solidarity — amusing yet deeply serious — both by granting each of the bears a distinct voice and energetic intelligence and by leaving the status of the polar bears’ relation to humans questionable. In what seems to be devolution from pure fantasy to stark realism, Memoirs of a Polar Bear moves from a bear who has a job, attends conferences, converses readily with humans, and writes (in the first chapter) to one who converses with a human only in dreams they share (in the second) to one who can’t speak to humans at all (in the third). The world of the novel feels larger for offering such a wide range of possibilities for the bears’ consciousness and communicative ability. Memoirs of a Polar Bear puts its playfulness to serious use. With varying degrees of levity, Tawada draws parallels between species divisions and categories of human difference. When the grandmother moves to Germany to avoid exile for her writing, she is asked whether she is “a member of an ethnic minority.” The grandmother is uncertain: “Was my clan part of an ethnic minority? It’s certainly possible that we are fewer in number than the Russians, at least in the cities, but high up in the North, many more of our sort exist in Nature than Russians.” The question of the relation between species and ethnicity returns to the fore when she encounters Kafka’s “A Report to an Academy” as a reading exercise in a textbook she’s using to learn German. She becomes fascinated with the fact that Kafka “wrote several stories from the point of view of animals.” She remarks, “What I mean is that this literature is valuable as literature, not because it was written from a minority perspective.” Tawada plays, too, with notions of human rights and humanism. The grandmother observes, “I began to realize that my fate and the fate of human rights were inextricably entwined. […] The concept of human rights had been invented by people who were thinking only of human beings.” Though the bears are occasional participants in the human ethical sphere — as in the case of the polar bears who serve in the circus with Tosca who, in a comical turn, resolve to form a labor union — their frequent omission from it frames the beginning of a post-human critique of humanism, which has always functioned by exclusion. Once I started using the word “I,” the words spoken by others struck me like stones. I would flop down on the bed, exhausted and wrung-out, thinking how nice it would be if I could spend my time only with Matthias. Alone with him: that must be just as nice as being all alone, or even better, since I could then take this new burden called “I” from my shoulders and relax as Knut. Memoirs of a Polar Bear is rich with the bears’ longing — for freedom, connection, primordial return. In the first chapter, the grandmother writes of “[her] first longing for far off lands”: “Distant places I’d never seen were drawing me to them.” Early in his life, Knut perceives this same inchoate drive in his sense that “every outside world had yet another world outside it that filled [him] once more with unease.” When, he wonders, will he “finally be able to reach the outermost outside world”? This yearning, the novel suggests, is something inherent to polar bear-being, somehow linked to the bears’ “gleaming white” fur, which, the grandmother observes, “is unlike any ordinary white” and is tied to what Tosca’s trainer calls “the snowfields on which polar bears write their lives.” These threads come together in a strange unity for Knut as he imagines a return to the bears’ homeland: “I wanted to lie dreaming of the North Pole in chilly air, wanted to see a snowfield before me, a field that — unlike newsprint covered with gossip and lies — would gleam an immaculate white. The North Pole had to be as sweet and nourishing as mother’s milk.” Tawada masterfully transports the reader to this place approaching transcendence, where language — so distinctly human, we suppose — brings us into imaginative intimacy with another kind of being. Nathan Goldman is a writer living in Minneapolis. His work has appeared or is forthcoming in Literary Hub, the Kenyon Review Online, Prairie Schooner, The Scofield, and elsewhere. Find him online at nathangoldman.com and @nathangoldman.